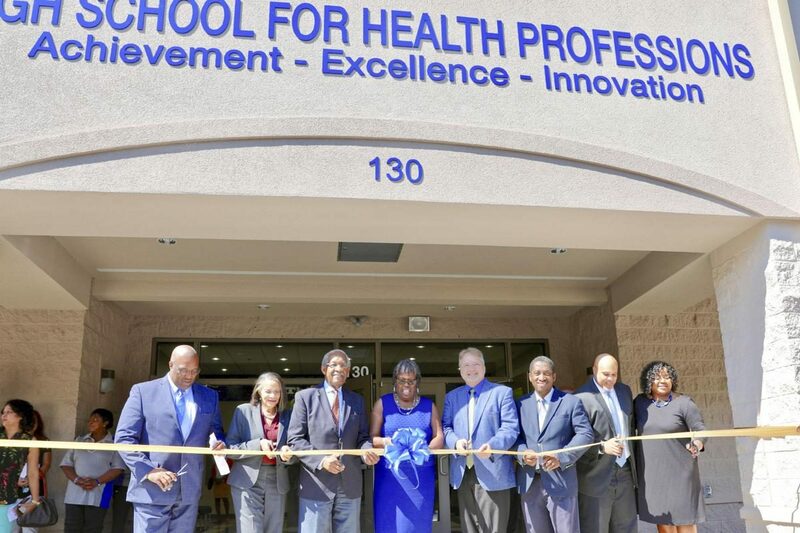 The Orangeburg Consolidated School District Five (OCSD 5) community wanted to create a charter school to serve high school students who aspire to careers in the health profession. The school provides in-depth training from career healthcare professionals and pays all school approved tuition as well as text and material fees for students taking dual enrollment courses at local colleges. This helps remove financial barriers for students pursuing dual credit while enrolled in the high school. Students pursuing this option have the opportunity to attain the equivalent of an Associate’s Degree and/or sophomore status at the college level. The opportunity to pursue postsecondary education at no cost is critical for Orangeburg County students and their families, as the school is located in a county struggling with persistent poverty. The OCSD 5 High School for Health Professions currently serves 372 students and is a bright spot in an underserved community. OCSD 5 is a Title I school with a free/reduced lunch rate of 99%, yet it has maintained a graduation rate of 98.5% over the course of its nine years in operation which is well above the state average. Many of the students enrolled in the school have gone on to be the first in their families to attend college. The OCSD 5 has received a $3,825,000 from South Carolina Community Loan Fund, through the USDA Community Facilities Relending Program, for the purchase of a new facility for the High School for Health Professions. The new school is an upgrade from the current outdated facility, which does not have central heating or air and is cooled in the summer months only by window unit air conditioners. The new facility offers state-of-the-art technology including labs for instruction in a variety of disciplines and an updated security system which will allow staff to create a more secure learning environment. This 16,500 square foot space sits upon 7.09 acres of land and will allow the school the opportunity to grow and expand as enrollment increases. In addition, this loan will preserve 29 full-time and 2 part-time jobs.